Today will be a day long remembered. It has seen the end of excuses for procrastination, and soon it will see the end of writing downtime forever. I’m talking about the release of Scrivener for iOS. I’ve been using the Windows version of Scrivener for years, and can’t imagine taking on a novel-length project without it. (Short stories I can do in Word, Notepad, draft emails in my Gmail outbox…) In fact, I’m not sure I’d be capable of writing a novel in anything other than Scrivener. My only problem was a lack of a mobile option. We have one desktop PC, which does the job, but going into the study feels a bit like work. Sometimes you just want to crank out a scene with the telly on in the background, or skim through some chapters and tweak some of the wording. I developed a workflow to let me do this on my Android tablet and, later, my iPad Mini. At the end of each writing session in Scrivener, I’d compile the manuscript into a text file and store it in a Dropbox folder, along with an identical copy. On my tablet/iPad, I’d use a simple text editor to work on the manuscript. All I needed was a text editor that integrated with Dropbox. On Android it was Jotter, and on iPad it was Plaintext. When I got back to the desktop and Scrivener, I’d use WinMerge to compare the edited file against the copy of the original, and paste the updated bits into Scrivener. It wasn’t ideal, but I probably got quite a few thousand extra words written for each of my novels. It wasn’t too bad for adding a chunk of text to the end of a manuscript, but if there was any serious work involved, I’d have to wait until I was at the desktop. Even searching for a word or flicking back to an earlier chapter was a nuisance. A novel isn’t a big long stream of text – it has structure. 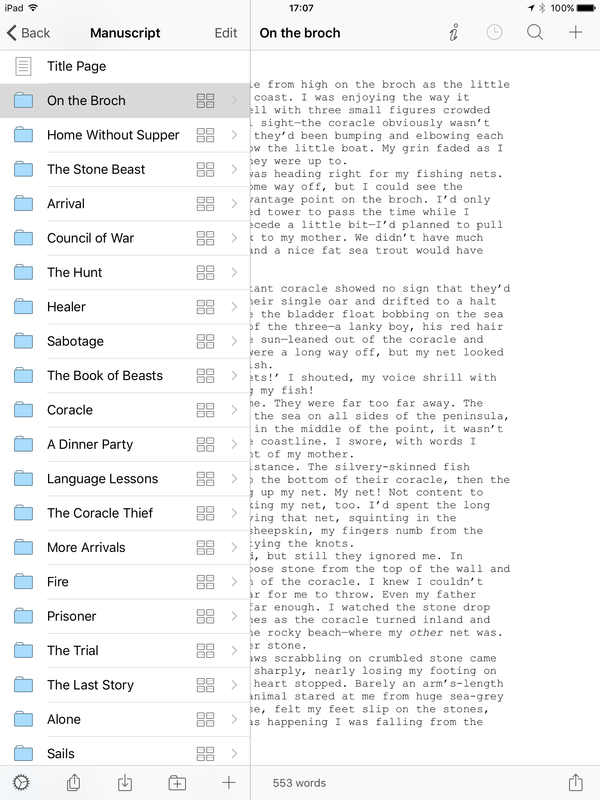 So you can imagine I’ve been looking forward to the iOS version of Scrivener for a long time. When I won the Great War Dundee Children’s Book Prize, I used part of the prize money to buy an iPad Mini (replacing my aging Android tablet) so I’d be ready for the release, which I imagined would be imminent – that was well over a year ago! But it’s here now. As soon as I got home today, I placed my order on the App Store and downloaded it. At £14.99 it’s not the cheapest app in the store, but it’s very reasonably priced for its capabilities. The first thing I did was link the app to Dropbox. I already stored my Scrivener projects in Dropbox, so this took no effort on my part. It took a while to synchronise – I’ve got eight novel projects plus some variant versions plus a batch of short stories – but once it did, all of my Scrivener projects were available on my iPad. I opened up the project for The Beast on the Broch, and there it was in all its glory, complete with hierarchical chapter and scene structure. It feels instantly familiar. It’ll take a little while to explore the features, but I can instantly see that it’s an enormous leap forward compared to my previous mobile workflow. 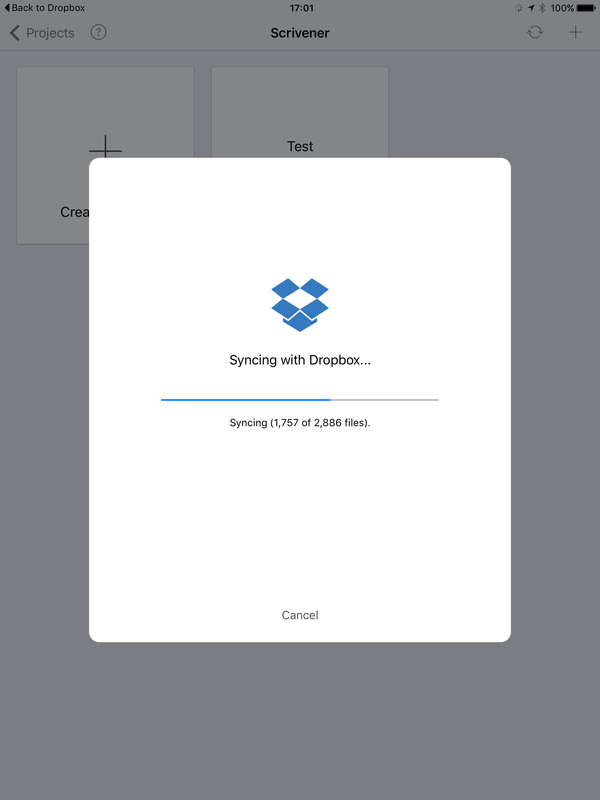 The Dropbox synchronisation seems to work extremely well, so it’s going to save me a huge amount of time. So now in weather like this, when it’s just too hot to contemplate sitting at the desktop with the sun in my face, there’s nothing stopping me from working on my writing from the comfort of my armchair.